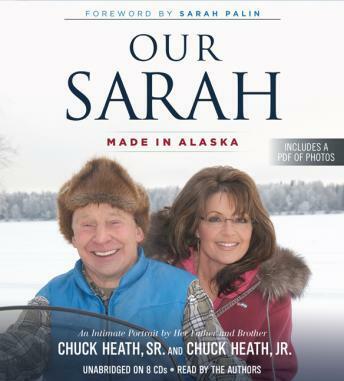 Narrated By: Chuck Heath Sr., Chuck Heath Jr.
We may think we know Sarah Palin from all the coverage she has received in the political arena, but one-side depictions but media coverage is limited and, Sarah would even say, biased. OUR SARAH is also a bit biased since it's written by Sarah's dad and brother with contributions from many friends and colleagues--these are the people who know her--and love her--best. Combining the appeal of Sarah Palin's bestselling book, Going Rogue, with the flavor of the hugely successful TV show "Sarah Palin's Alaska," here are intimate stories from Sarah's life along with a celebration of growing up in and sharing all that Alaska means to Sarah and her family. Sarah's dad and brother share great family stories of life in the last frontier--from hiking, camping, fishing, hunting and gold-mining, to marathon running, teaching and community service--first in small ways and then on a national stage. Structured around themes of family, faith, independence, resilience, character, risk-taking and adventure--here is a full and loving portrait of where Sarah Palin came from and what made her the person she is today.